An short article on Sputnik mentioned the possibility of using the Okhotnik as guards for the PAK-DA. Hole wrote: An short article on Sputnik mentioned the possibility of using the Okhotnik as guards for the PAK-DA. and a little electronic (radar) compartment. As for radar comportment. Su-57 has radar "all over the fuselage" so Okhotnik can have too, not necessarily small in terms of capabilities. Supersonic drone but used mainly to escape threats for short distances thanks to afterburners. 5000km autonomy so 2500 km max range. Mig and yak also worked on drones but they didn't produce them. Sukhoi working on that because they finished su-57. Can carry same load of weapon as su-57 since it has the same weapon bays so 4 kh-58/38 or guided bombs. It also shares lot of tech from it like its landing gear that should be however be lighter. Big bird of 25 tonnes take off weight. And then upload your images by clicking select file and choosing an image. It will load it and then run optical character recognition software over it and then choose French and English as your options or what ever you want to translate to or from and then click on the text in the image and it will automatically translate it for you. Supersonic, and 4 kh-58, would be great. I am happy I have been proven right , this thing is Supersonic. If this can go Mach 1,14 at low altitude with AB at high altitude this can go even faster. I had debated this on many forum only to get answer this wing cant go supersonic , Even a brick can go supersonic if it has enough thrust. Effective target discrimination and target prioritization is a big fat if without human input. This task aka its automation shouldn't be left to a drone. If a single-seater pilot is controlling more than 2 drones the workload will overwhelm him more than likely. now? very likely but mind that even now most of flight functions can be and are automated. Su-57 AFAIK c an l and/take off in unmanned mode. Tech is developing pretty nicely and in 10 rather then 15 years unmanned aircraft should be reality. ATLASCUB wrote: What happens the moment the pilot of the controlling Su-57 becomes a target of of a SAM battery or enemy planes? perhaps a lowest priority drone takes the rocket (or shoots it with DEW weapon) . Why would you assume you cannot teach drones to fight? Or are we going to suggest they enter into this A.I mode where they become expert dogfighters? Please....we're not there yet, not even close. Austin wrote: I am happy I have been proven right , this thing is Supersonic. 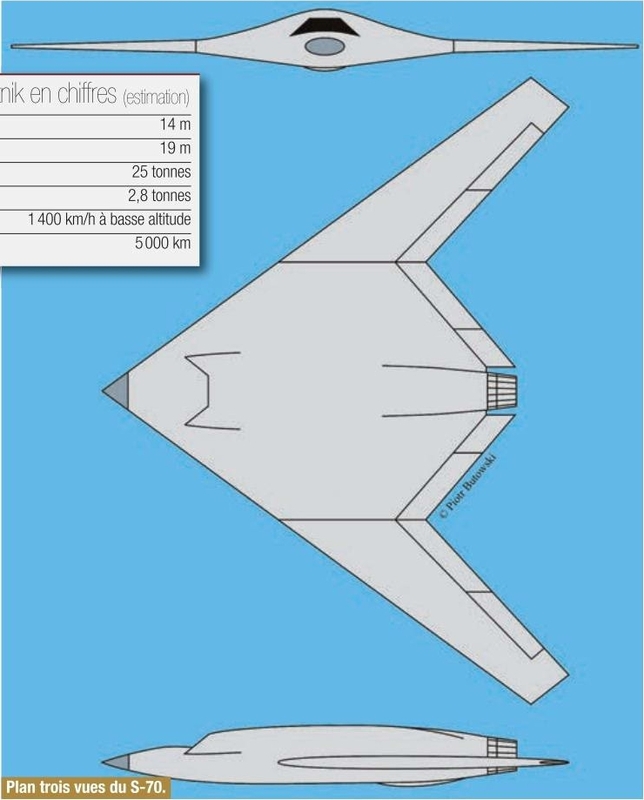 Isos wrote: Supersonic drone but used mainly to escape threats for short distances thanks to afterburners. 5000km autonomy so 2500 km max range. 5,000 km (non ferry) range -> 2,500 km radius ? Isos wrote: Mig and yak also worked on drones but they didn't produce them. MiG still is, currently on 10 tons one. GarryB wrote: Why would it be supersonic? I figured out from the Engine nozzle being kept out would be for just 2 reasons , Use of TVC and use of AB. One of the things that makes the proposed flying wing design of the PAK DA be considered subsonic is because there are no supersonic flying wing designs and that is because of control issues. In terms of supercruising its very low drag should be ideal, but lack of tail surfaces to allow controlled flight during transonic flight when the cg shifts dramatically suggests that if you could accelerate to supersonic speeds, the loss of control and subsequent crash would mean it was not worth it. If the PAK DA could supercruise then that would transform its performance potential enormously too. So the estimated weight is heavier than a rather bigger Su-35, but it has half the thrust in having just one engine. It is written 5000km autonomy which means ferry range. So it should have 2500km range . But I think he gave this number so that we can compare with drones of the same type. I doubt he has such information. For those that have bothered to read and translate the article does it mention the source of this information. No source. It is in the square with basic caracteristics. Like I said he seems to give that number to put the drone in the class of big and long endurence drones. Nothing official. Of course, a fat plane with huge endurance and payload that is supersonic and highly manoeuvrable would be great. Even better if it is cheap and stealth. Reality shows we have different planes for different roles and not only one wonderplane for all of them. So, still not convinced this thing can be supersonic or that it really makes sense for it to be. Look the wing of a supercruiser like the Su-57, its profile has nothing to do with the one from Okhotnik. There were comments about a supersonic strike drone, so maybe a confusion comes from here. Or maybe I am wrong, perfectly possible too! LMFS wrote: So, still not convinced this thing can be supersonic or that it really makes sense for it to be. Look the wing of a supercruiser like the Su-57, its profile has nothing to do with the one from Okhotnik. a) wingman ekhm wing-robot for Su-57 doesn't have to be fighter yet speed doesnt contradict its shape. Mind all tailless fighter designs. b) of course A&C speculates, perhaps izd. 30 could be the origin? GunshipDemocracy wrote: a) wingman ekhm wing-robot for Su-57 doesn't have to be fighter yet speed doesnt contradict its shape. Mind all tailless fighter designs. I refer specifically to a wing which has high aspect ratio (ca. 19 m wingspan) and relative thickness, this is the wing of a subsonic plane with very high lift and fuel carrying capability. It would IMHO create very big transonic drag, so I even doubt a single engine, even with AB, could bring this plane beyond sound barrier. Stated speed at low altitude is the same of for instance MiG-29, with way higher T/W and more aerodynamic design... so this part of the report doesn't look realistic to me. As to controllability in supersonic flight without keels, newer designs rely as far as I know in (fluidic) TVC, so quite new technology. I don't know any supersonic flying wing which is operative, but don't discuss whether this is possible or not. 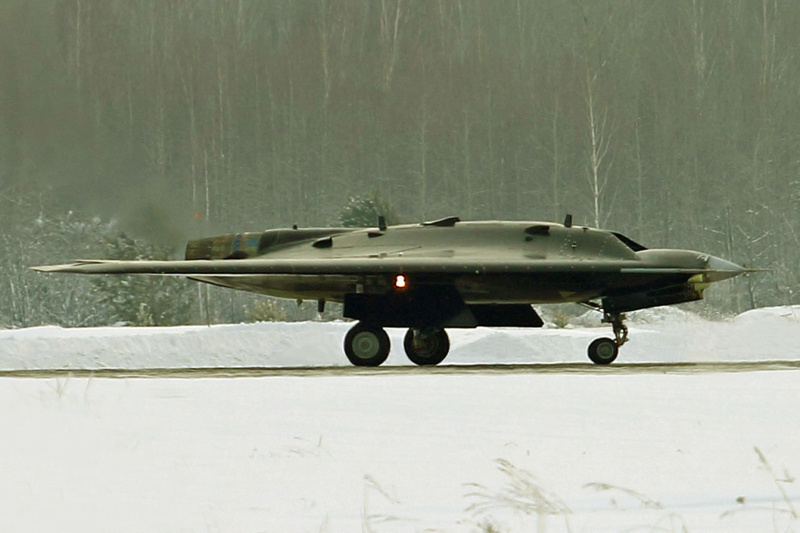 The suggestion that Russia will use this drone to suppliment numbers so its Su-57s and these drones could take on NATO on even terms is amusing.... I don't doubt this drone might be useful in such a situation but I also suspect Su-35s and MiG-35s and MiG-31s and MiG-41s would also be very useful in such a conflict... just because the west is getting rid of all their 4th gen fighters does not mean Russia will... and indeed by using the S-70 as a drone fighter they are basically already using 6th gen fighters now are they not? Russias main weapons against western fighters are S-400/-350/-300 and S-300V/BUK-M3/M2/Tor and Pantsir (plus a few systems I didn´t mention). The only part of this video I could agree with is that UCAVS will or could occupy the lower side of a hi-low mix, and that would not 100% apply since manned and unmanned would complement each other differently than for instance heavy and light fighters do. But I agree and have said previously that a mix of UCAVs for different roles and Su-57 could make a new light fighter unnecessary. > They call a plane with almost 20 m wingspan "small and cheap", and display it significantly smaller than PAK-FA in the infographics to suit their point. Well, Su-57 is 14 m wide, to make a comparison... and the TO weight has been volumetrically estimated at >25 T. Small and cheap my arse! @Hole: agree, in Russia air force is a complement of SAMs and not the other way around. They don't need to overwhelm NATO with their fighter numbers, just wait for Western planes to try to come close. That plus planes like MiG-31, which are almost impossible to engage for NATO, attacking critical assets like ISR planes and blunting air raids would be enough of a roadblock for Western air superiority. The drone seems to lack radar. So air to air missions are not a mission it will have. I see it like a bomb/missile truck. Su-57 will tell him where and when to hit and it will most of the time release the weapon controled by the su-57. For anti radar, su-57 will find the air def radar stay at good distance and tell the drine to go on it at full speed qnd release ARM missiles. For bombing, su-57 will carry a laser pods or give the gps coordinates and the drone will release the bombs. For air to air, most likely it will be used for r-37 carrier. Su-57 will track at long range the AWACS and the drone will accelerate towards it and launch the missiles. Su-57 will carry only air to air missiles and protect himself and the drone from air threats and maintain superiority. The drone has nothing of a 6th gen fighter. It is clearly not designed for air to air. But rather air to ground controled by the su-57. It cab also work by its own for bombing missions like launching cruise missiles on static targets but if it get caught by a f-22 or 35 and no su-57 protects it, it's dead meat. @LMFS S-70 drone is not cheap as dirt but easily cheaper than Su-57 fighter. a)you dont spend time/money on training (both intl and 200h/year flight) pilots - hour of flight forSu-30MKI is ~$14,000, I dont think in Russia it is cheaper, especially for Su-57. 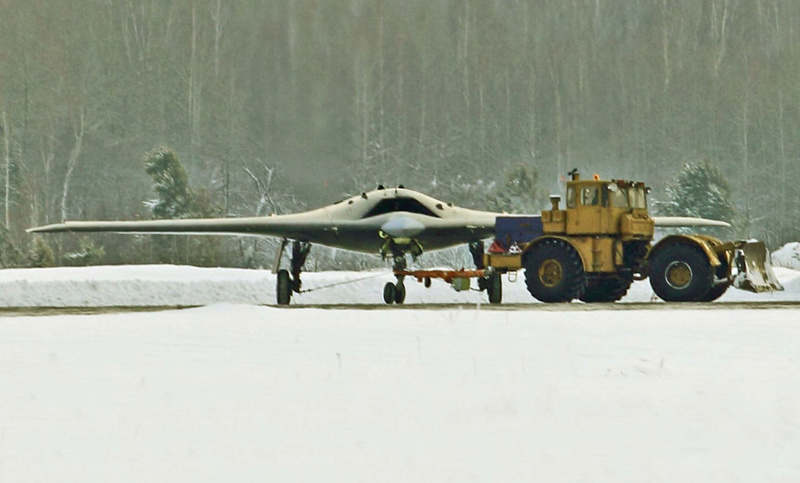 GarryB wrote: The suggestion that Russia will use this drone to suppliment numbers so its Su-57s and these drones could take on NATO on even terms is amusing.... 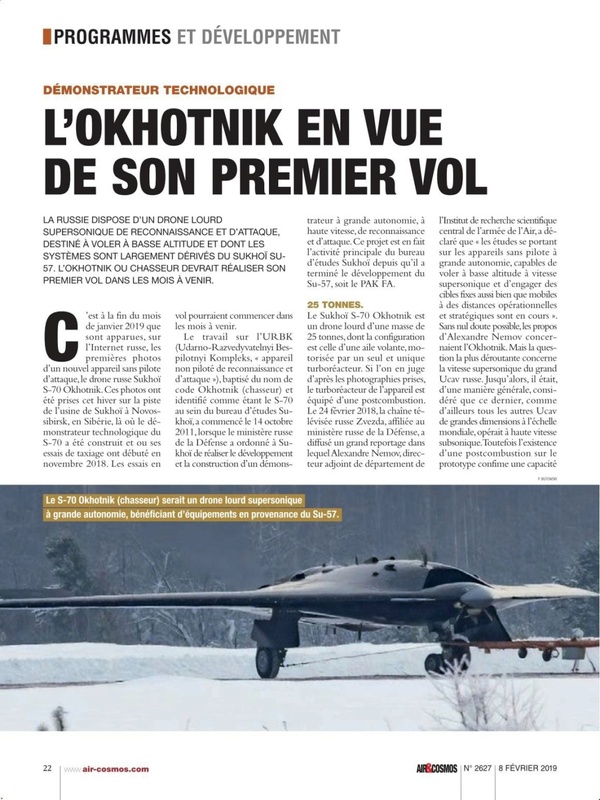 I don't doubt this drone might be useful in such a situation but I also suspect Su-35s and MiG-35s and MiG-31s and MiG-41s would also be very useful in such a conflict... just because the west is getting rid of all their 4th gen fighters does not mean Russia will... and indeed by using the S-70 as a drone fighter they are basically already using 6th gen fighters now are they not? 2) S-70 can be perform strike/recon/missile truck roles - what is the difference if slow drone fires BVR missile and rest takes over Su-57 autopilot? or Su-57 itself? It can also carry internally aa od ag missiles so Su-57 doesn't have. + the whole team remains stealth for strike mission. 4) drone can use EM gun for team self-defense - KRET once said EM wont be carried by manned aircraft. To big danger apparently for pilot. Im not saying Im right here but this is how I see this opportunity. Hole wrote: Russias main weapons against western fighters are S-400/-350/-300 and S-300V/BUK-M3/M2/Tor and Pantsir (plus a few systems I didn´t mention). Isos wrote: The drone seems to lack radar. So air to air missions are not a mission it will have. It does not need radar to launch A2A missiles with targeting info coming from any other node in the network. Gunship wrote: @LMFS S-70 drone is not cheap as dirt but easily cheaper than Su-57 fighter. Yes, I just found tone of the video misleading. This will be an expensive machine. To me the main issue is about pilots of modern planes not being replaceable in war conditions. It is not anymore about piloting, it is about managing very complex weapons systems in complex informational environments so you need many years of training and high intellectual capability to cope with the tasks. UCAVS can be sent where you wouldn't dare sending pilots and get the task done, regardless of the plane surviving or not, which allows you to be much more aggressive and effective. Plus of course, they will operate all the same without need of training and many other advantages we already discussed. But it is, among other things, about supercruise. This has been confirmed by Russian sources. I remind that we don't have official weight figures for any of both. Last estimations for Okhotnik, considering 2.8 tons payload, are 27-28 tons TO weight. Just look at the size of the thing compared to the tractor vs. Su-34 in same conditions. The plane is simply huge. It has a radar, take a look at the pics again. 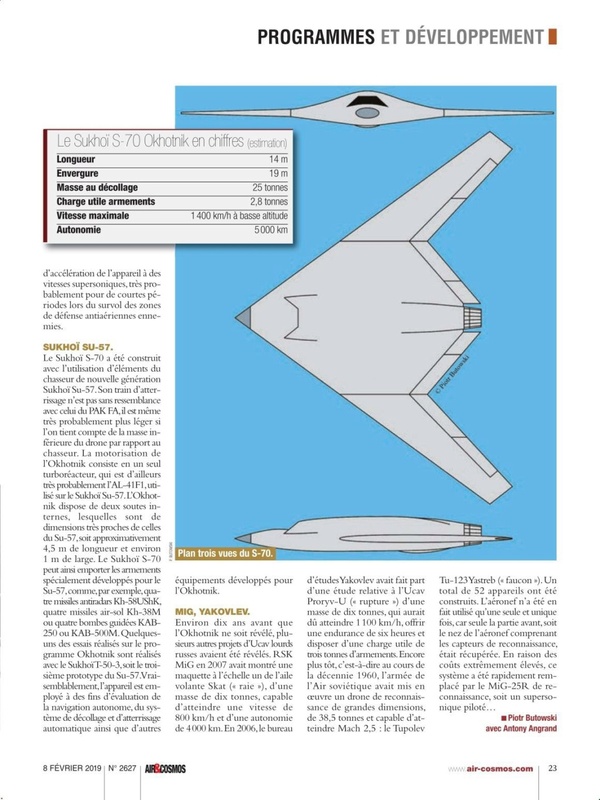 According to some sources the new A-100 can control drones from 650km range (relay for ground control?) One A-100 in the middle ofSyria could control dozens of drones anywhere in the country.